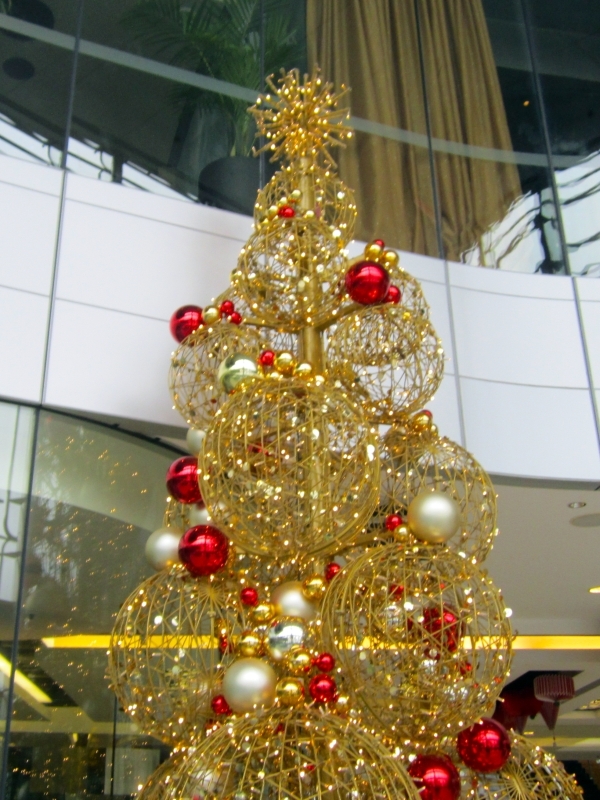 Since moving to Singapore, I’ve spent many Christmases in places that don’t have winter. 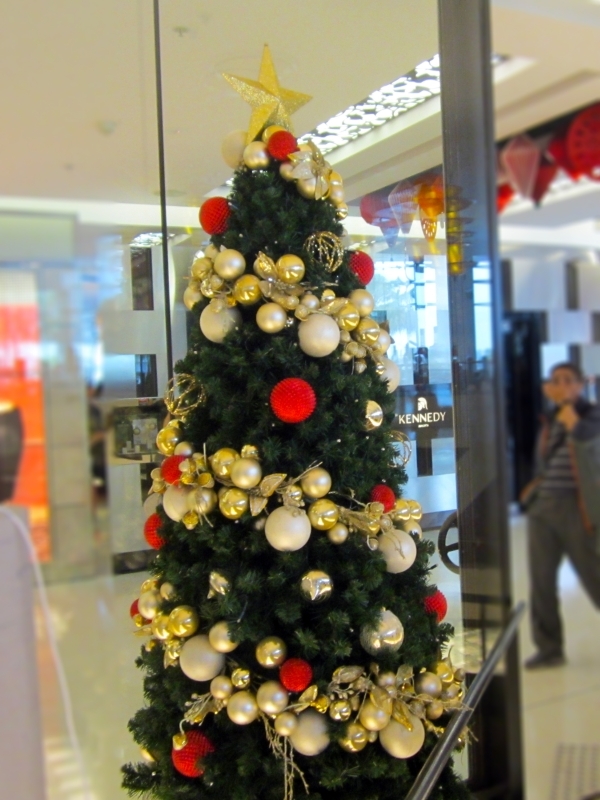 This year I celebrated the holidays in a place that does have winter, but has it at a totally different time of year. I’m still trying to wrap my head around the idea that winter can happen at different times of year. 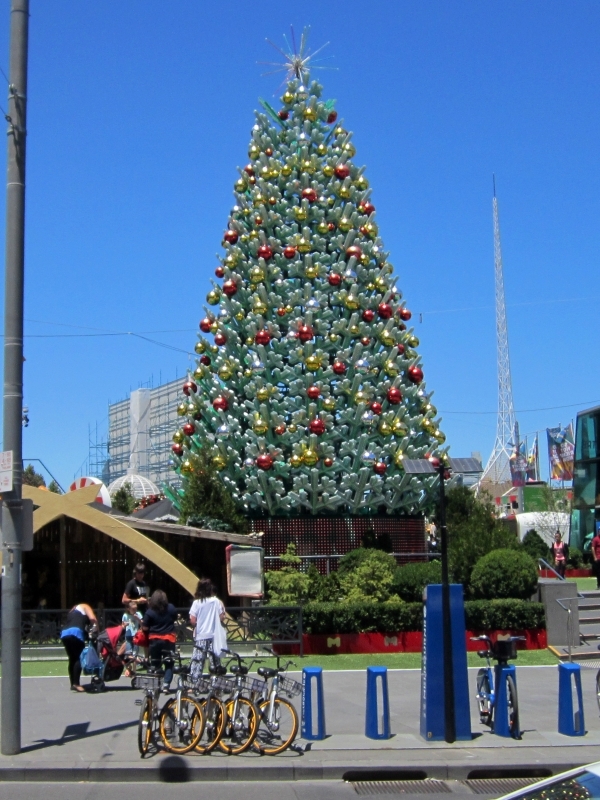 It’s almost easier to believe that winter is hot and summer is cold than that winter takes place during the, uh, summer months (June, July, and August) and that Christmas takes place during summer. 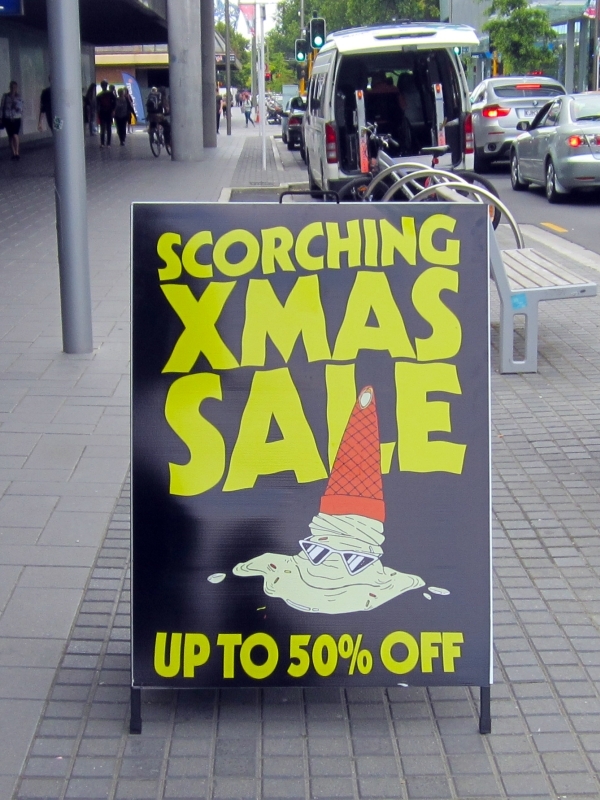 Below are 30 more holiday photos. 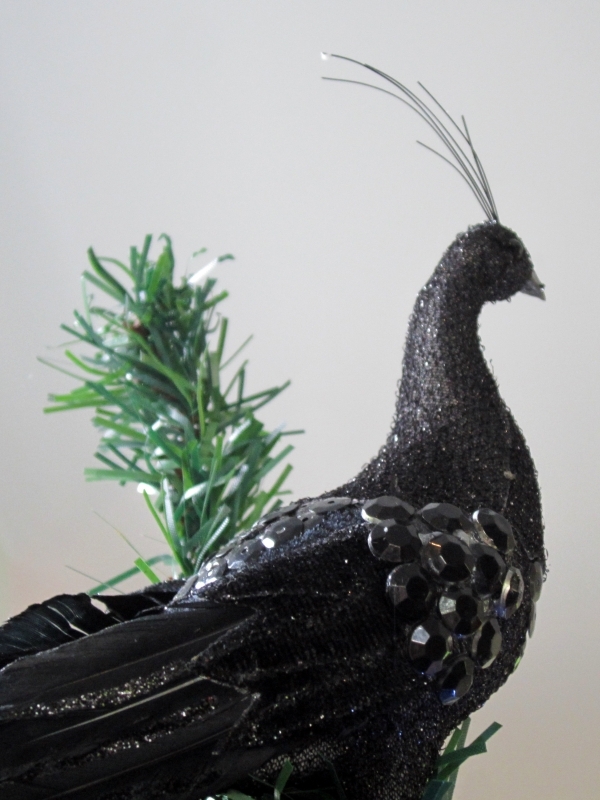 A Christmas peacock at our hotel in Wellington. 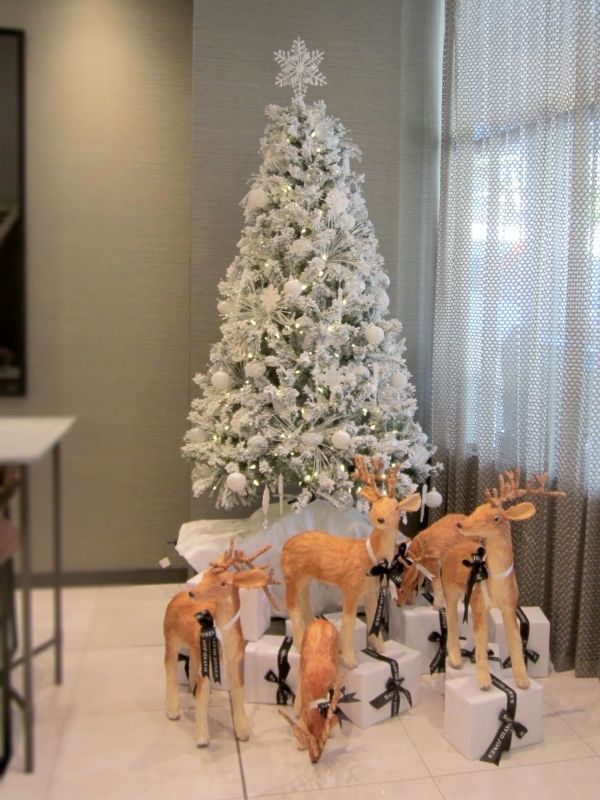 The deer are a nice touch… this is in our hotel in Wellington. 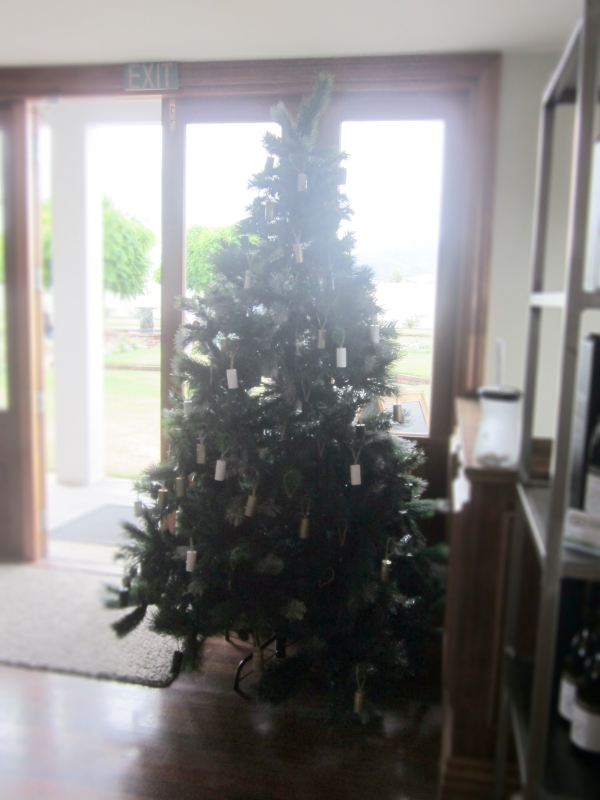 In Marlborough (wine country), you decorate for Christmas with bottle corks. 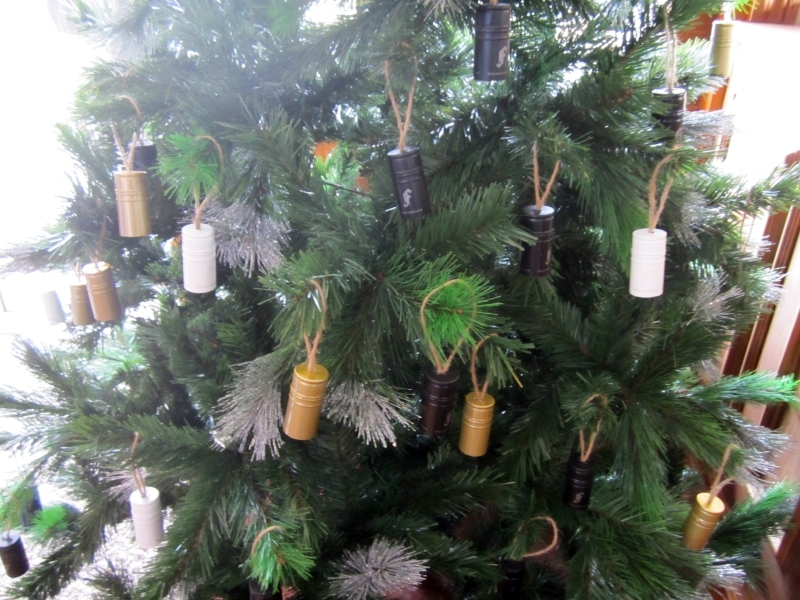 A close-up of the corks and lids on the Marlborough tree. 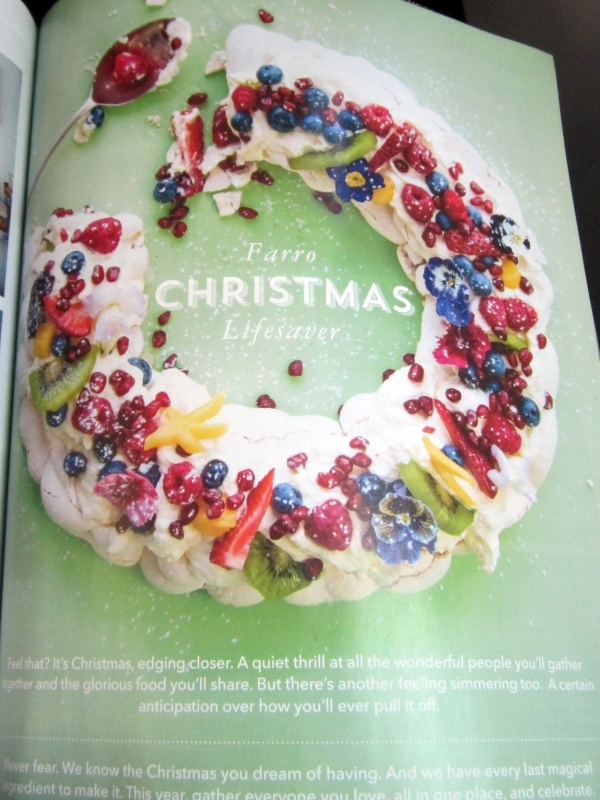 Right, so apparently there’s this Russian dessert called Pavlova that people traditionally eat at Christmas in Australia and New Zealand. 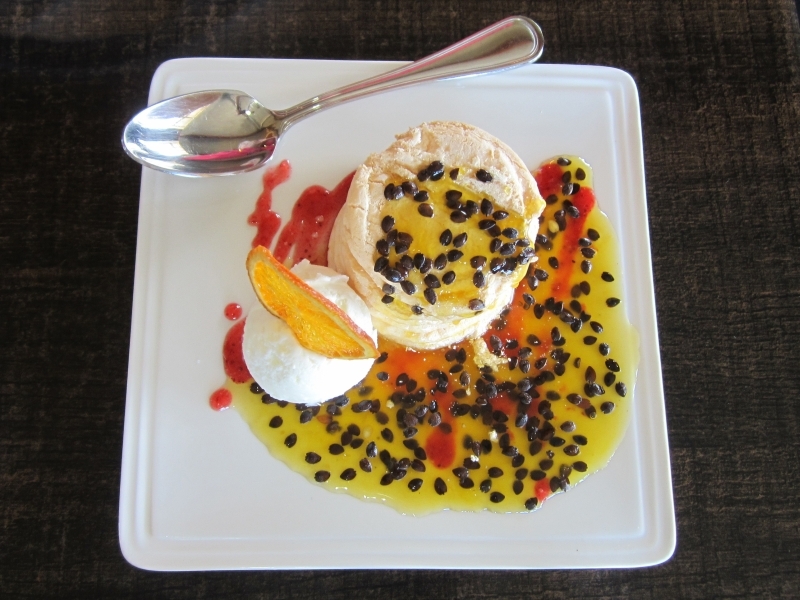 As far as I can tell it’s meringue with fruit. 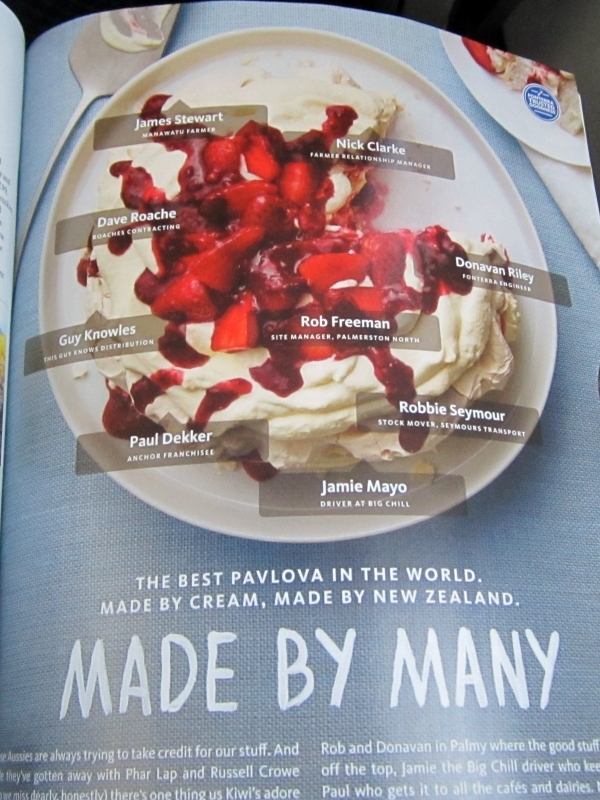 Here’s a pavlova with different fruit. 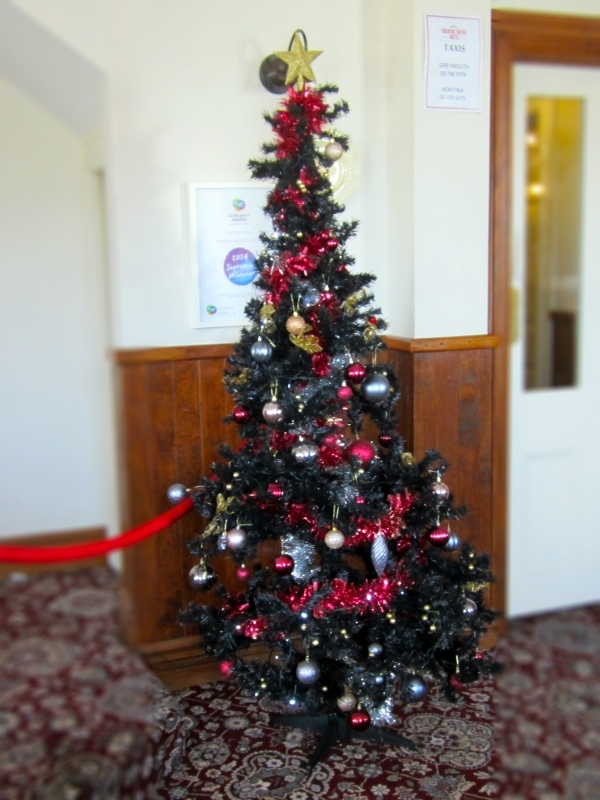 This tree stood at the foot of the stairs at our hotel in Christchurch. 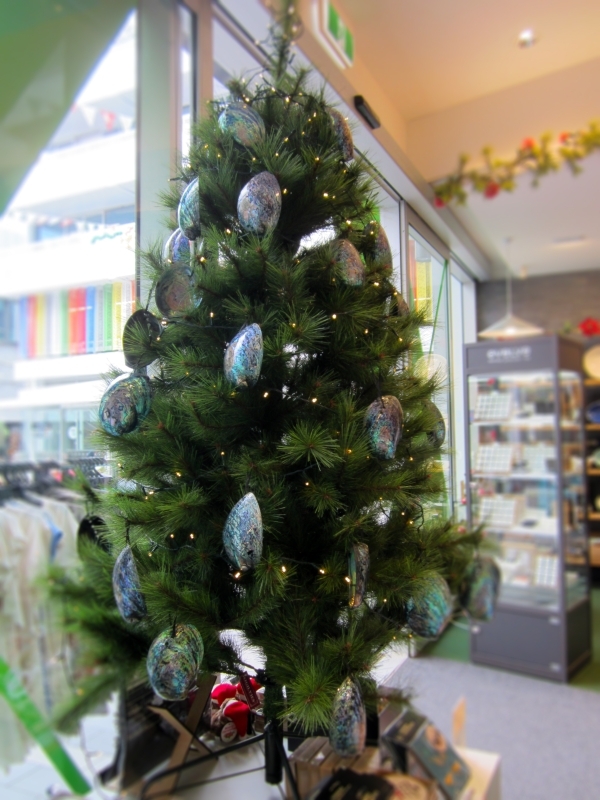 Many tourists shops sold things made from abalone (paua) shell, but this is the only abalone Christmas tree I saw. I’ve never seen anyone do this before. Genius. 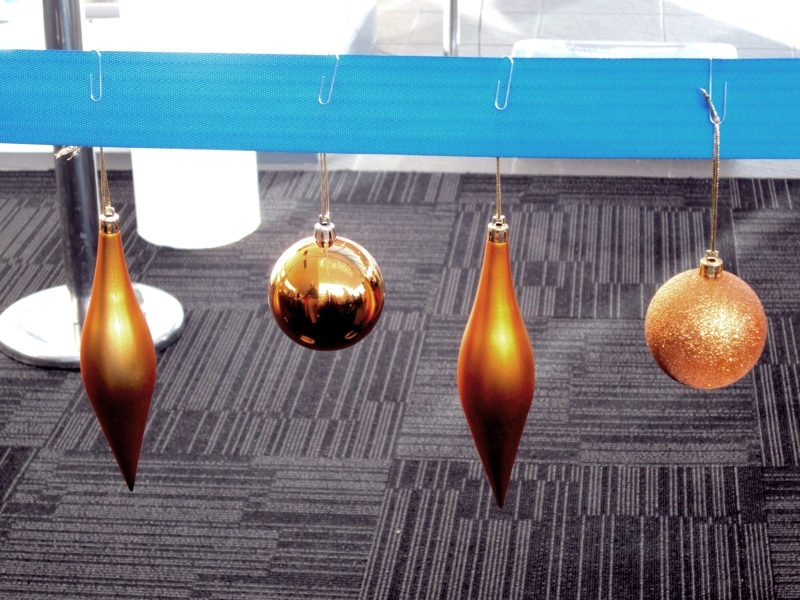 They put ornaments on the stanchion ribbons! 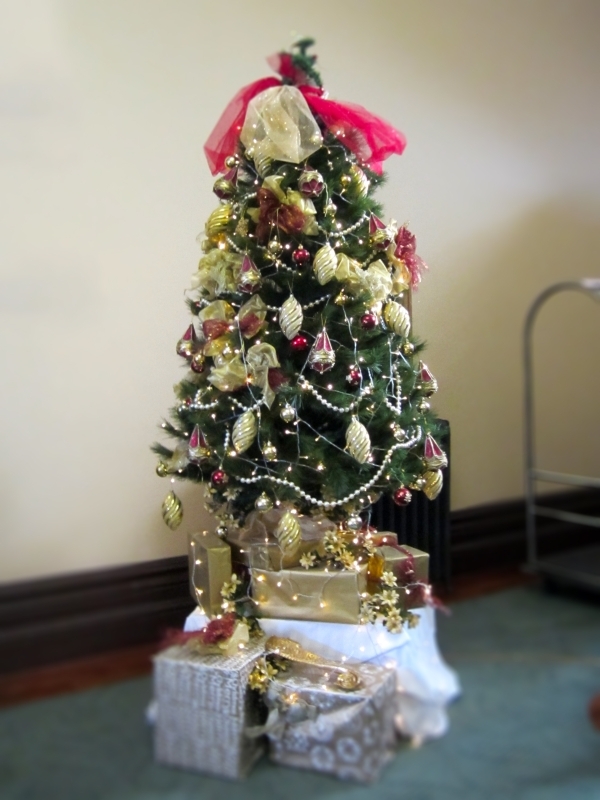 Our hotel in Kumara had a sparkly tree. 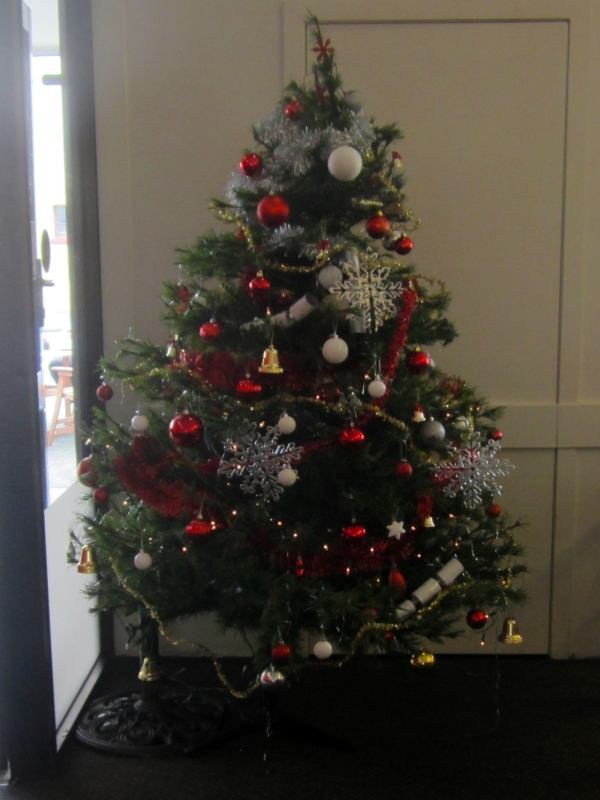 This tree was in a restaurant in Hokitika. Somewhere on the way to Queenstown, I tried pavolva! It was okay. 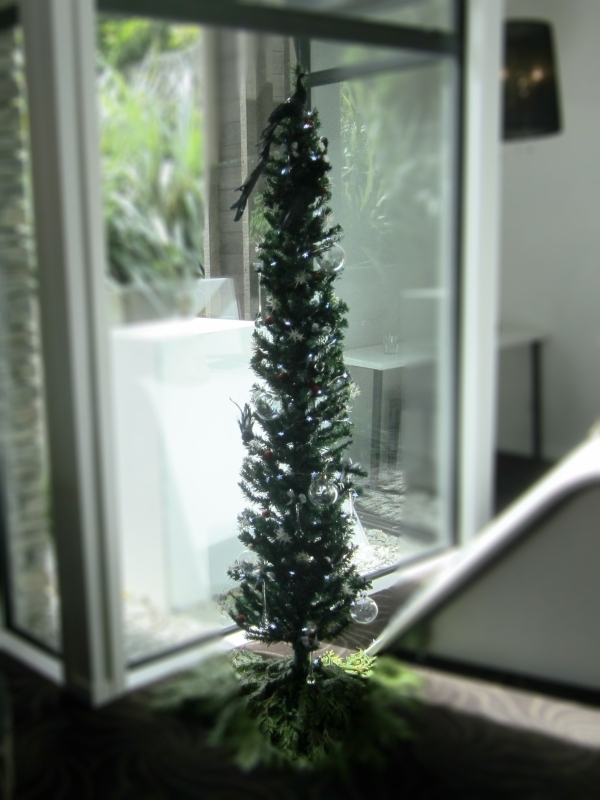 This unconvincing conical tree is at the restaurant where I tried the pavlova. 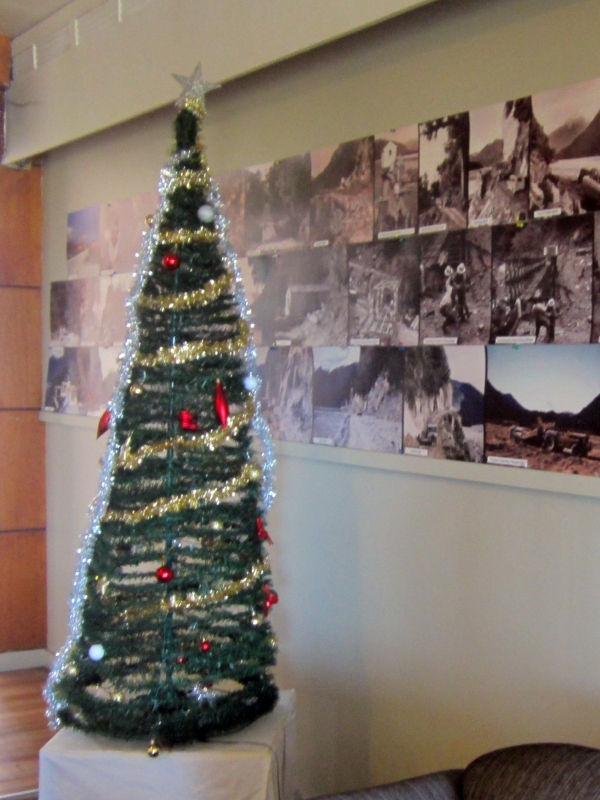 The tree in our Queenstown hotel wins the prize for “most carrot-like”. It had cool black peacocks on it, though. 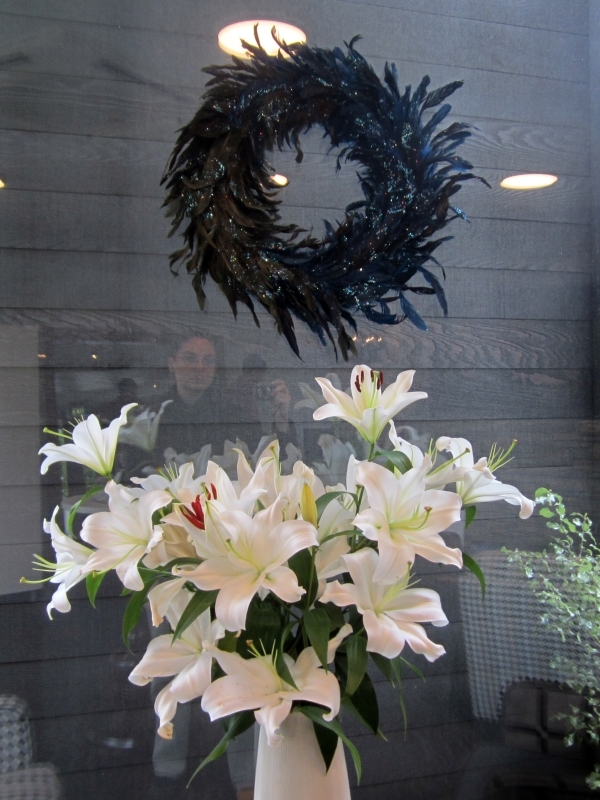 In fact, the Queenstown hotel was quite stylish, though personally I associate white lilies with Easter (or funerals), not Christmas. 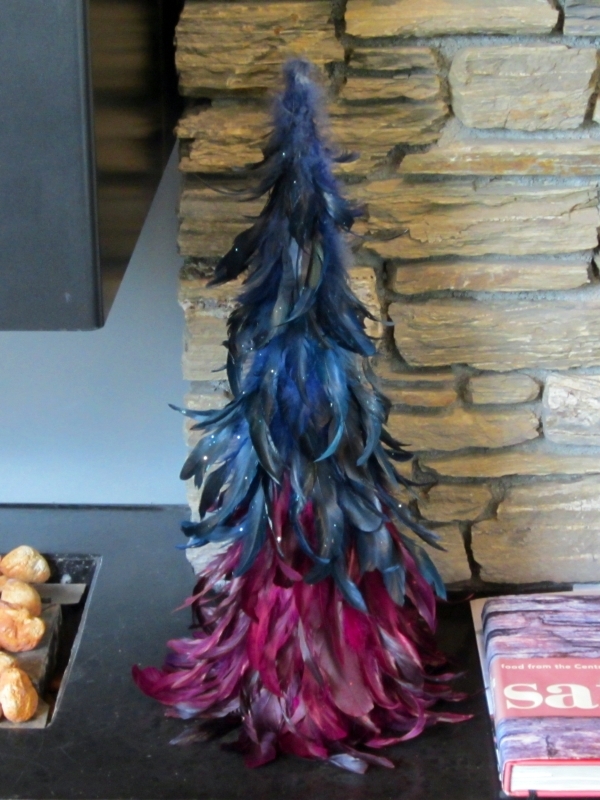 The Queenstown hotel not only had a feather wreath, it had a feather Christmas tree. 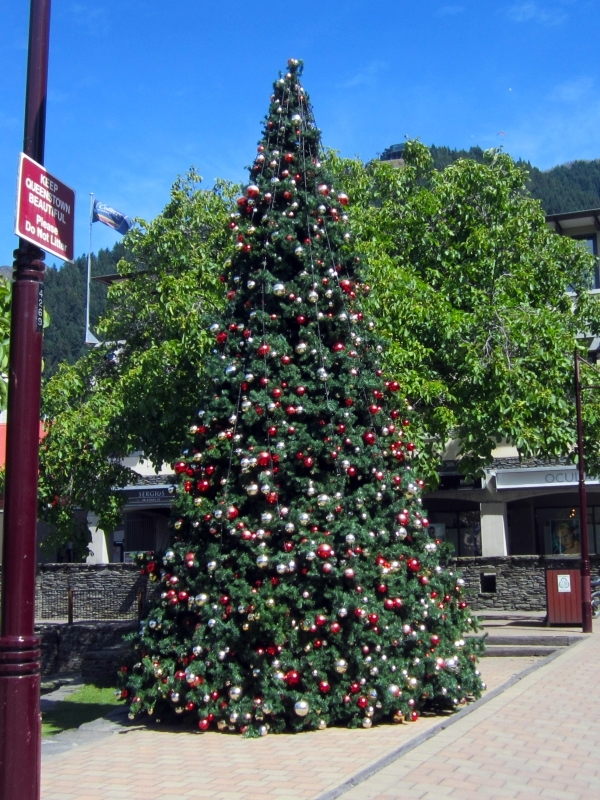 This tree outdoors in Queenstown was one of the biggest I saw. 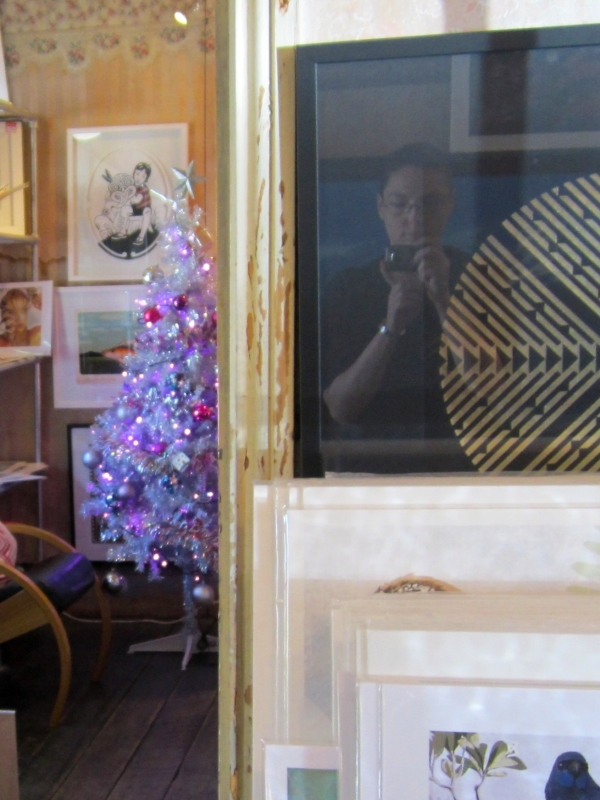 This art gallery and shop had a PINK Christmas tree! 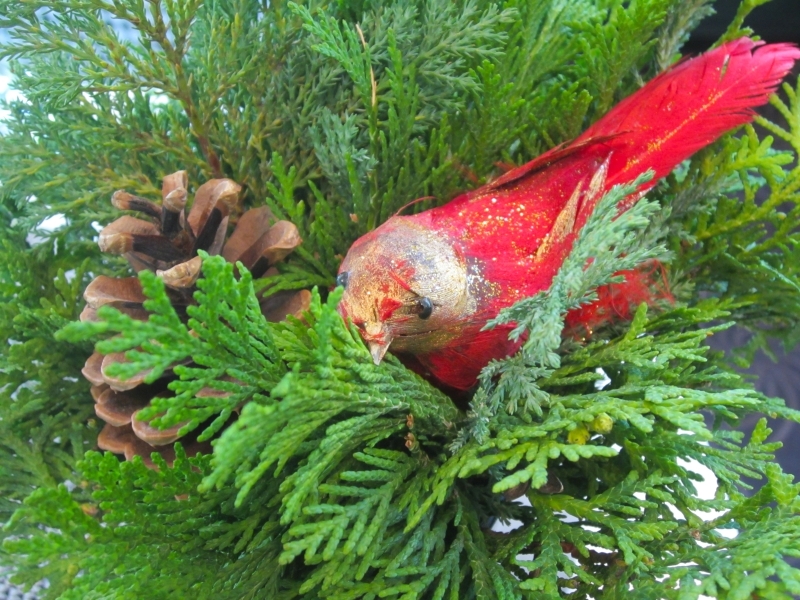 I saw a lot of wild birds in New Zealand, but none of them looked like this. 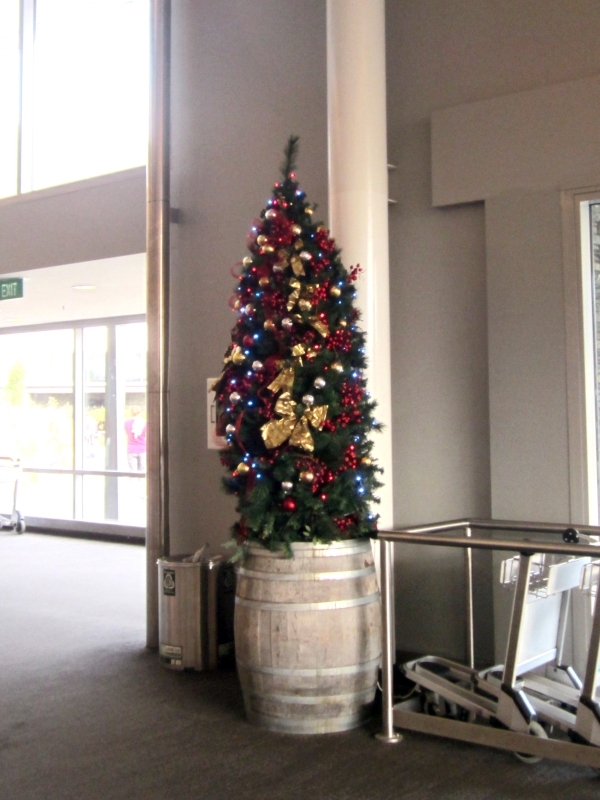 Saw this precarious tree in the airport on the way to Melbourne. We arrived at our Melbourne hotel VERY tired, in the middle of the night. 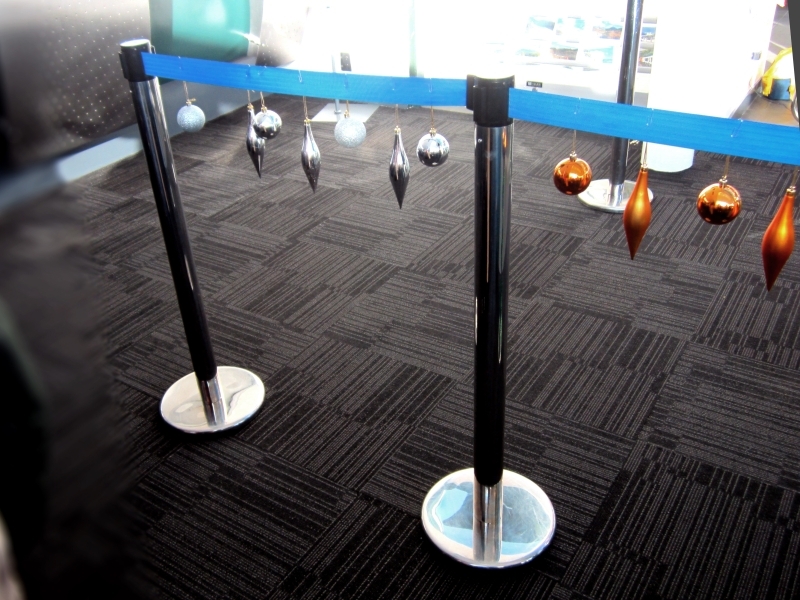 The lobby was quiet. This was the biggest of the trees I saw. 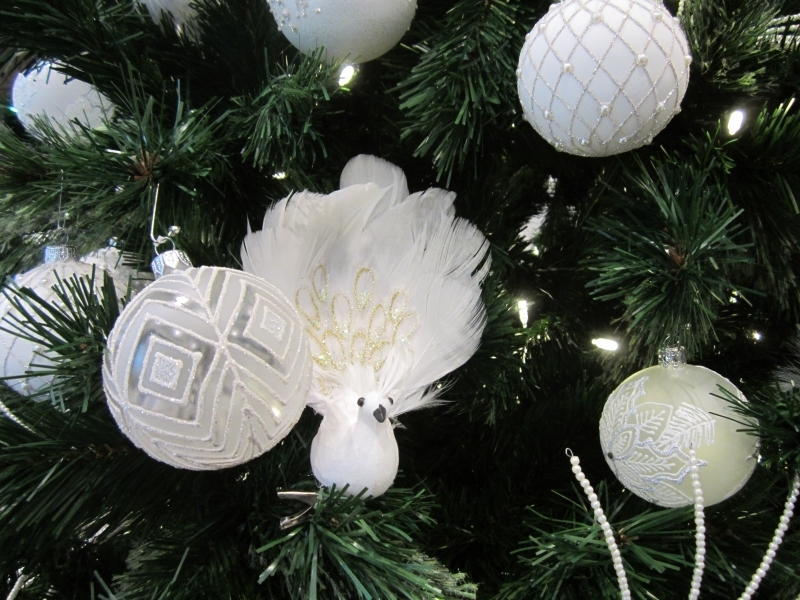 It seems to be made of frosted green snowflake arms. Very geometrical. 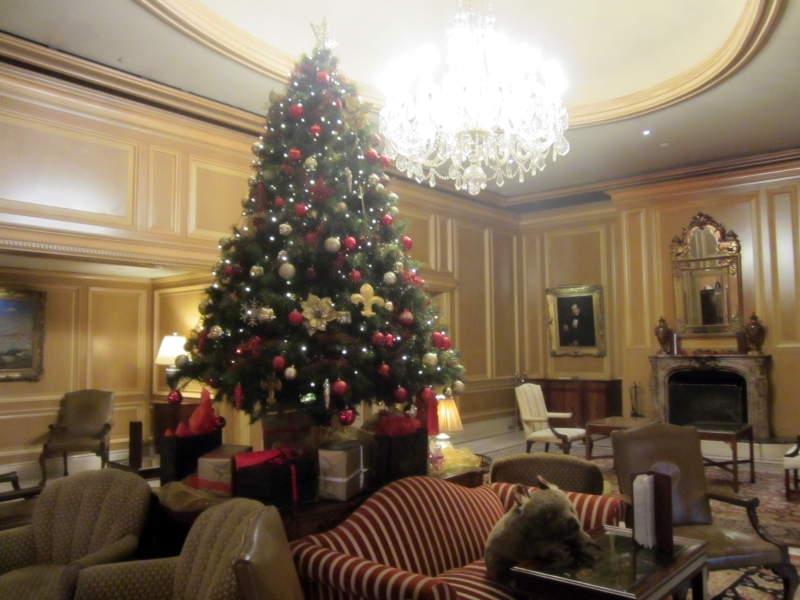 We had high tea at the hotel in Melbourne. 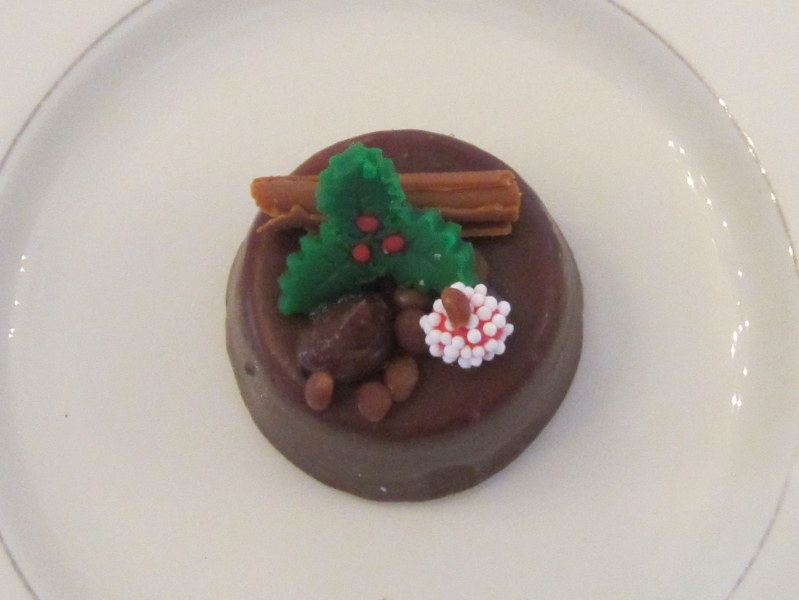 This was one of the treats. 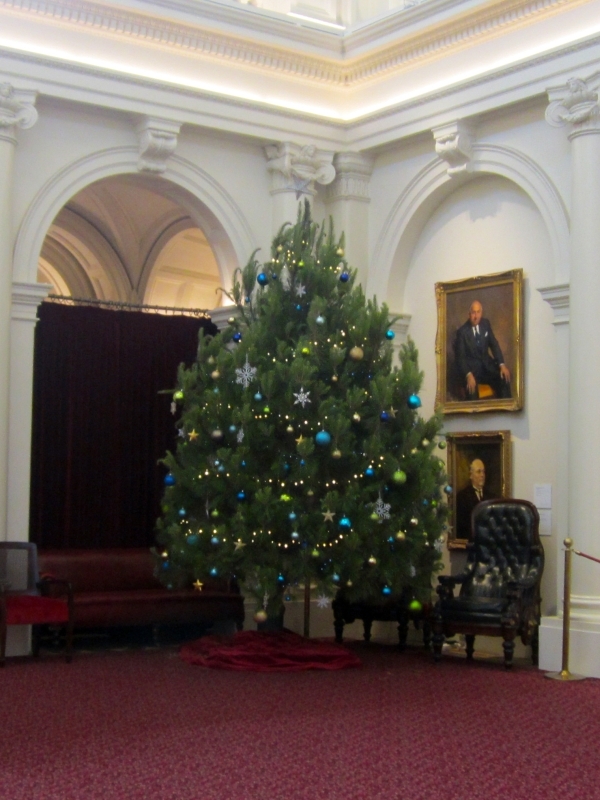 This tree at the Victoria parliament building in Melbourne can be forgiven for looking a bit awkward because unlike many of the others, it’s a real tree. 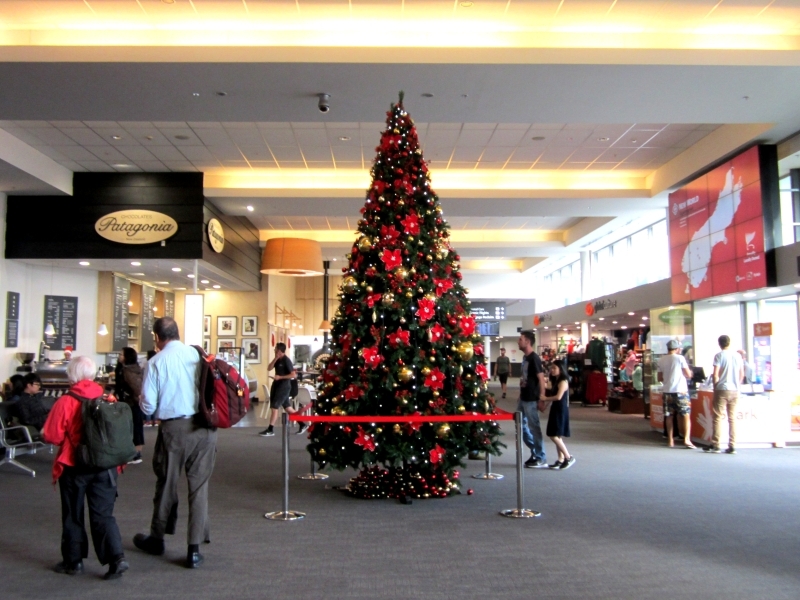 At the restaurant in Sydney where we ate Christmas lunch. 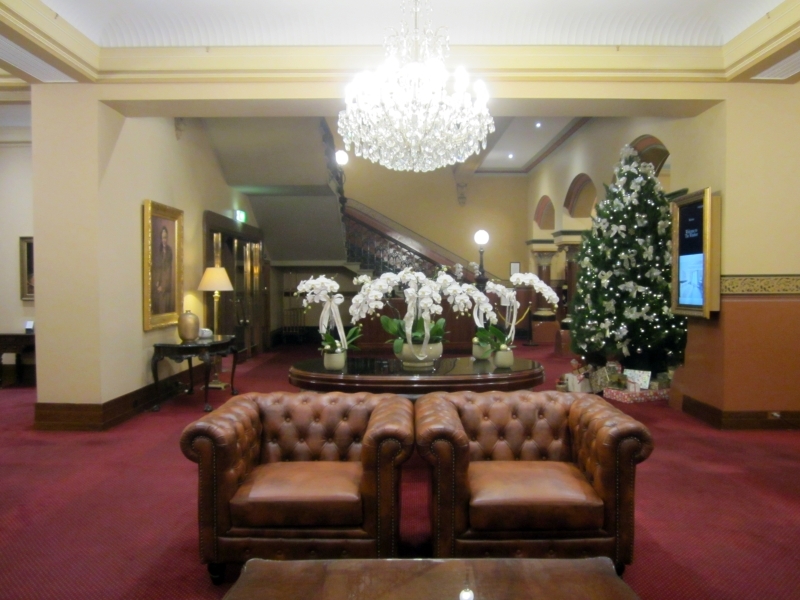 Our hotel in Sydney had a lovely paneled lobby where a wombat stood guard to make sure nobody shook the gifts under the tree.